Built to original Stromberg blueprint specification, with key improvements. Yes, they're back, even though they never really went away. And they're just the same, But better than ever. The Genuine Stromberg 97. 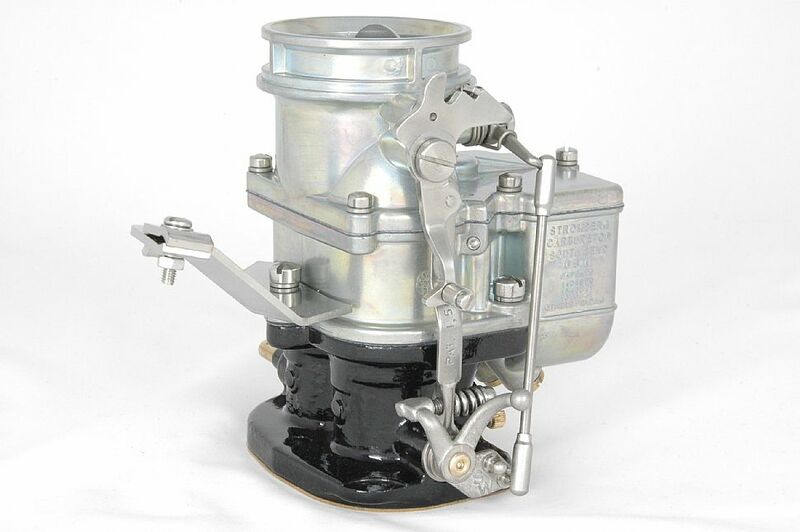 A brand new carburetor with Stromberg on one side. A big 97 on the other. And on this model, an exact re-issue of the original Stromberg cable choke lever and bracket, as used on special aftermarket 97s made for 1949-53 Ford models. Available only from Stromberg Carburetor. Please note: You can use the cable choke option on the centre carburetor or a 3x2 set, but the cable mounting bracket must be mounted on the rear carburetor and the cable brought forward. Super-accurate pressure die-castings from new dies, CNC-machined for a blue-print parts fit. So no oversize screw threads. No mystery parts from previous rebuilds. No problems. An early style cast iron base with stock size - not second-best oversize - throttle shaft. Parkerized and black lacquered just like they used to be. A reinforced air horn casting with extra material around the float bowl lid to eliminate warping and leaks. Stock original (sea level) Stromberg jetting – 0.045 main jets and a Number 65 power valve. 162cfm out of the box (independently verified) measured at 1.5inch Hg (same as they measure 4-bbl carbs). A new brass float, made in USA on original Stromberg dies. A specially developed no-stick S-Jet inlet valve. Modern, high-tech, reinforced gaskets. Sorry, no leaks. Stainless steel linkage throughout. Who needs rust? Not us. Our springs are stainless. So is the accelerator pump rod, the throttle linkage, choke plate, lever and more. Beautiful investment cast stainless steel throttle and accelerator pump levers. Correct pale chromate zinc treatment using the original Ford Service Bulletin process. Original-style riveted throttle and choke shafts. Extensive dyno and road tests have proved that it matches or exceeds original spec. Remember, like any carburetor, the Genuine Stromberg 97 needs proper installation and tuning for optimum performance. Every 97 comes with full installation instructions and we are working on help with tuning in our Tech Center. Note: Original hand throttle parts are not included. If you need them, email us, as we can probably find you good used parts.